WHAT TIME DOES BURGER KING STOP SERVING BREAKFAST ? What time does Burger King Start Serving Breakfast ? For those early mornings where you are running late and haven’t had a chance to grab something to eat or when you just feel like treating yourself to a nice treat, Burger King’s breakfast menu is well worth trying out. What time does Burger King stop serving breakfast ? and what time does it start. You can get a great idea by browsing the breakfast times below. Whether it’s a cup of coffee and a quick snack or a nice platter of all your favorite breakfast foods, Burger King is a quick and easy meal that isn’t lacking in taste. For the most part, Burger King breakfast menu specializes in breakfast sandwiches. For example, you can enjoy a hearty meal with the Supreme Breakfast Sandwich, which combines various breakfast foods on a toasted hoagie bun. Toppings include fluffy eggs, succulent sausage patties crispy bacon and is topped with rich American cheese. Most of these foods can be found throughout the breakfast menu at Burger King. You can easily find your favourite combo of these foods and stack them on a bun of your choice. For instance, a classic biscuit sandwich is always a sure-fire hit, although Burger King also has a specialty sandwich that is incredibly tasty. The Croissan’wich uses a delicious flaky croissant as the bun and is a unique breakfast sandwich you won’t find anywhere else. It comes with any of the popular breakfast foods and makes for one heck of a sandwich! What Time Does Burger King Start Serving Breakfast? 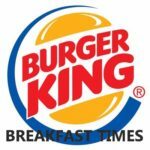 Burger King starts serving breakfast at some of the earliest times around, making them a fine option for those who want an early breakfast. For example, the majority of Burger Kings will start serving their breakfast menu at 6 am every day of the week! Better still, you may find some Burger Kings that start serving breakfast even earlier at 5.30 am! Then again, some other locations will start a little later than these times, usually around 7 am. Burger King stops serving their breakfast in later in the morning, making way for their standard food menu. This means that some Burger King will stop serving breakfast as early as 10.30 am. However, you will also find some Burger King locations that stop serving breakfast a little later, usually around 11 am. Do they serve breakfast items all hours of the day? If you happen to have a hankering for a croissan’wich and get to counter after breakfast hours (11:00 am) you will not be able to order one. This is because BK holds firm on the not serving any breakfast specific food items on their menu after the set time for breakfast to be served and that is posted on their menu boards. So, in order to be sure that you can fulfill your need for croissan’wich you need to be sure you get up extra early to be sure you beat the clock. If you want to know when your local Burger King starts or stops serving breakfast, it is best to contact the restaurant. For contact details, simply visit the Burger King website and use the locator tool to find your local restaurant.